If you want an apartment that will truly bowl people over, and you have millions to spare, look no further than this penthouse unit at 5 Tudor City Place in Turtle Bay (h/t Curbed). 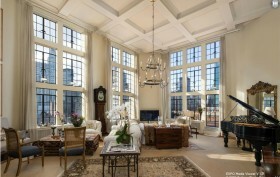 Massive windows, soaring ceilings, and a private terrace with griffins and gargoyles will definitely impress. The seller is Gordon Bowen, founder of the big-time advertising firm mcgarrybowen. He’s unloading his Don Draper-worthy penthouse to the tune of $7.2 million.